Light From Within is a clever cowl version of the classic boomerang-shaped scarf. 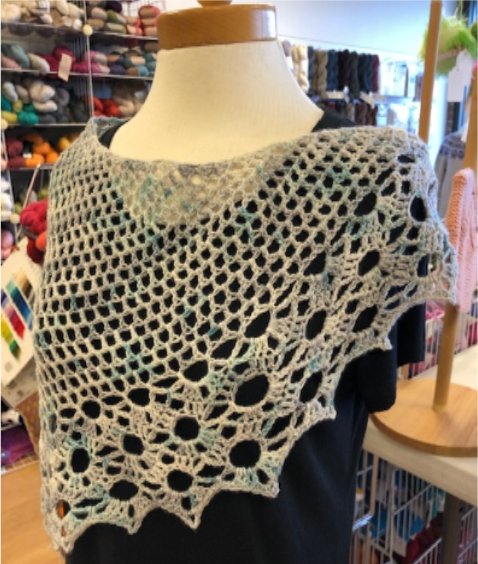 It has the same shape and drape, and gives the same look as the popular boomerang scarves in a very easy-to-wear version. The scarf is crocheted flat and the rows are on the diagonal. The stitch pattern of the main section is an easy-to-memorize two-row repeat. Once you reach the specified stopping point, you crochet the lace section of nine rows. Brady recommends blocking the scarf before sewing the final whip stitch seam to join in the round. This is an easy and fast scarf to crochet and can be made in one afternoon and requires only 200 yards of yarn. Sample made in one skein of KPPPM (Koigu).